When Chase and Malcolm attend a family party in Los Angeles, they expect to enjoy good food, good company, and a good time. However, an off-color joke rubs Malcolm the wrong way, and the two men get into a brutal fight that lands them both in jail. Malcom is black. Chase is white. Their conflict becomes a microcosm of a larger racial conflict in the United States. The two men, who were once friendly, return to their respective lifestyles, and their contempt for each other breeds violence along racial lines. 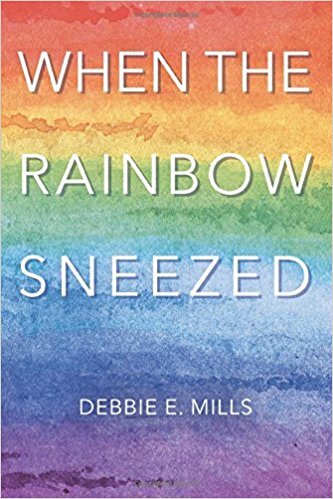 Told from the point of view of a neutral observer, When the Rainbow Sneezed touches on some of the most difficult problems facing the United States and the world—including racism, terrorism, and religious persecution. When tensions are at their highest, the community comes together for an important meeting in which they can air their grievances. At the gathering, a mysterious force blows through the crowd, and an enormous rainbow appears. The people gathered hold their collective breath as the rainbow appears to inhale—they don’t know it, but in just a moment, their lives are going to change forever. Debbie E. Mills is also the author of a pocket-sized book called The Little Book Big on Thanks. She seeks to inspire others through her books, music, and art. She currently lives in Southern California.